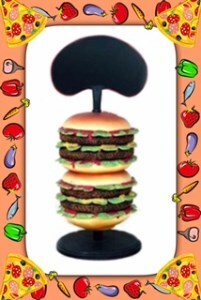 This Delicious Looking 2' Hamburger Resin Statue comes fully dressed and sure to please! Life Like Hamburger Statue is Handcrafted Resin, Metal and Wood, Measures Approx. 15"l x 15"w x 22"h and Weighs Approx 18 Lbs. Makes A great counter top Display to Advertise your Daily Specials. Butlersn and Signs offers free standard shipping to the lower US, although other arrangements can be made! Large Commercial Faux Food Displays - Ideal Decor for Events, and Fast Food Restaurants. Large Resin Food Displays! Butlers and Signs would like to welcome you to check out all of our Large Life Size Figures, Life Size Displays and Life Size Menu Board Displays, "There's Something for Everyone!" Stop, shop and buy with us today.